1Squash, ginger, chilies, lemon juice, salt and half of the onions and curry leaves. 3Sauté the rest of the onions and curry leaves in the vegetable oil. 4Add the previously prepared tuna mixture and sugar and stir-fry on low heat for about 5 minutes. 6Break the finished dough into small egg sized pieces. 7Using a rolling pin spread each dough ball evenly into circles that are about 7 inches in diameter. 8Cut the circle into 4 equal parts. 9Place about 2 teaspoons of the tuna mixture in the center of each flour quarter and fold in all three sides to make a triangle. 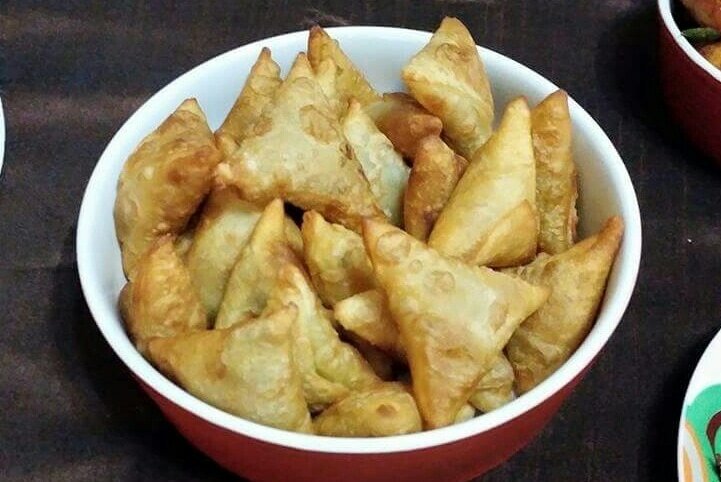 10Make a thick flour paste (water+flour) to glue the sides of the bajiya to prevent it from opening up during frying. 11Deep fry, drain and serve. (alternative: arrange on a non-stick tray and bake for about 15 minutes in a moderate (gas mark 4 / 180˚C / 350 ˚F) oven). 12Tip: Substitute the tuna with equal amounts of cooked chicken or beef (or any other meat) to make different kinds of bajiyaa. you need to parbake the roshi before its cut into quarters and the fish filling added or else the whole thing will be messy.